Kate Wilhelm – The Future is Female! Kate Wilhelm (June 8, 1928–March 8, 2018), born Kate Gertrude Meredith in Toledo, Ohio, was the fourth child of Jesse and Ann (McDowell) Meredith, both natives of Kentucky; at twelve, she moved with her family to Louisville, where her father worked in a flour mill. Soon after her graduation from Louisville Girls’ High School she married Joseph Wilhelm and had two sons, Douglas in 1949 and Richard in 1953. 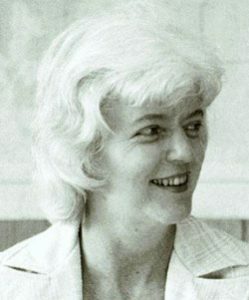 Her first published story, “The Pint-Size Genie,” appeared in Fantastic in October 1956, and she became a regular contributor to genre magazines thereafter, collecting her stories in The Mile-Long Spaceship (1963), The Downstairs Room and Other Speculative Fiction (1968), Abyss (1971), The Infinity Box (1975), Somerset Dreams and Other Fictions (1978), Listen, Listen (1981), Children of the Wind (1989), and And the Angels Sing (1992). 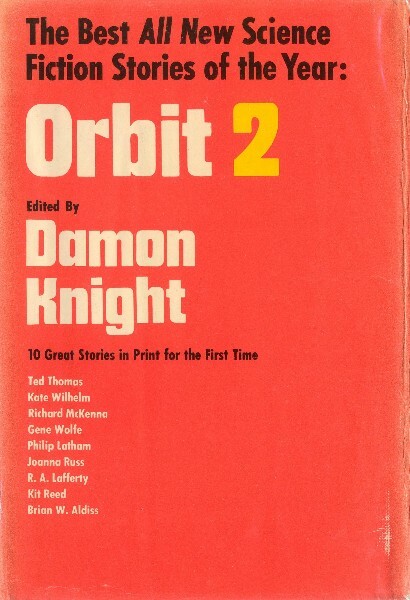 Divorcing her first husband, in 1963 Wilhelm married fellow writer Damon Knight; together, they raised five children from previous marriages and had a son of their own. 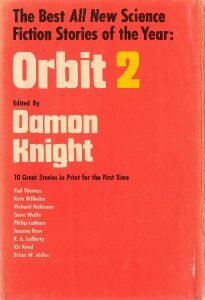 As hosts of the Milford Science Fiction Writers’ Conference from their home in Milford, Pennsylvania, and later, cofounders of the Clarion Science Fiction and Fantasy Workshop, they began a tradition of literary mentorship and mutual criticism that has influenced many careers and continues to the present. They also both lectured on speculative fiction at universities around the world. Wilhelm won Nebula Awards in 1969 (for “The Planners”), 1987 (for “The Girl Who Fell into the Sky”), and 1988 (for “Forever Yours, Anna”); her 1976 novel Where Late the Sweet Birds Sang received both Hugo and Locus Awards, and in 2003 she was inducted into the Science Fiction Hall of Fame. Along with speculative fiction she has also published more than a dozen mystery novels, her first, More Bitter Than Death, in 1963 and her most recent, co-written with Richard Wilhelm and featuring her noted detective protagonist Barbara Holloway, Mirror, Mirror in 2017. She died in Eugene, Oregon, where she had lived since the 1970s.